Posted on October 12th, 2018 by Richie Koch in Privacy & Security, Security. October is National Cyber Security Awareness month. This year, join us in our new campaign to identify which data we hold most dear, all in the name of spreading privacy. 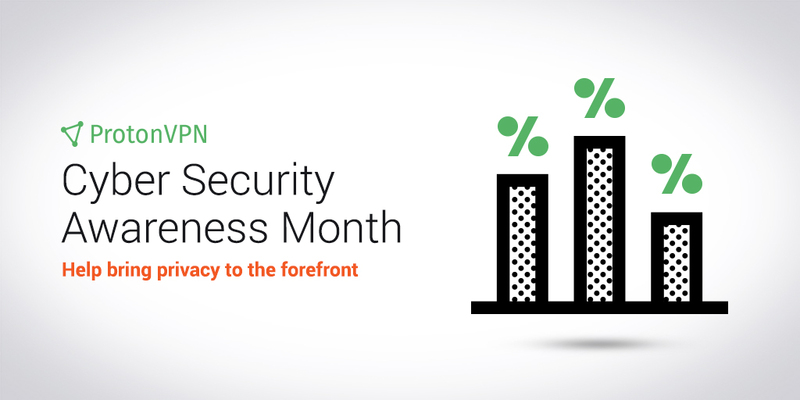 National Cyber Security Awareness Month was originally created as a collaborative effort between the US government and the tech industry to ensure that every American has the resources they need to stay safe and secure online. As a no-logs VPN service, we obviously take security and privacy seriously. But none of our projects will make an impact unless the public use them. That is why awareness is such an important part of our mission. Unfortunately, it seems like many people are only now beginning to grapple with the privacy implications of their online activity. This is truly one of the defining issues of our era. Mainstream tech companies will not prioritize user privacy until there is overwhelming public demand. While it is important to highlight new electronic surveillance legislation, uncover how governments collect and share your personal data, and create user guides that explain what you can do to protect your personal data, it can be hard for these arguments to strike a chord. Privacy is a visceral issue. It is a company or government accessing those private moments when you think no one is watching, like when you listen to the Bee Gees 30 times in a row because you just want to dance or when you search Google for the solution to “Why am I always sad?” That is why for this year’s Awareness month, we want to try something different. We are going to tweet out a series of questions asking you which data would be more embarrassing to you if it were leaked or exposed. We’re hoping it helps people appreciate the amount of surveillance they are subject to and what data they hold most dear. These data dilemmas will be presented in the form of would-you-rather questions, making you choose between two types of data leaks. Each question will be shared on Twitter with an interactive poll. We will also post the poll here on our blog along with the results. We invite you to create your own scenarios of impossible choices between two leaks of different personal data. Simply add the #datadilemma and maybe your idea will make it into one of our polls. The idea is to make you think about how sensitive your data really is and to question why the Internet, as currently designed, is founded on mass data collection. For this to really succeed, we will need your help, so please like and share our polls to help us get as many people as possible thinking about online privacy. We all say that online privacy matters to us, but we rarely give it any thought. By rethinking about the type of data that we are inadvertently revealing online, hopefully society as a whole can start thinking about why privacy matters and we can together build a safer and more free world.